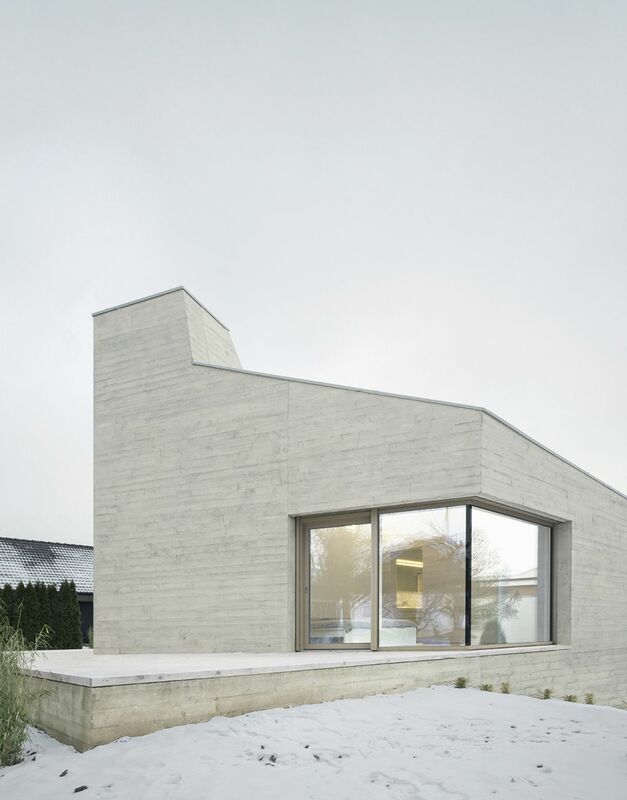 Somehow, the idea of living in a concrete house doesn’t sound that appealing and that’s because of the cold nature of this material. 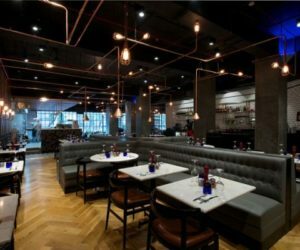 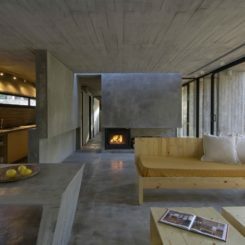 Concrete is not warm or soft or pleasant to the touch like wood is for example and that gives it a bad reputation in a certain sense. 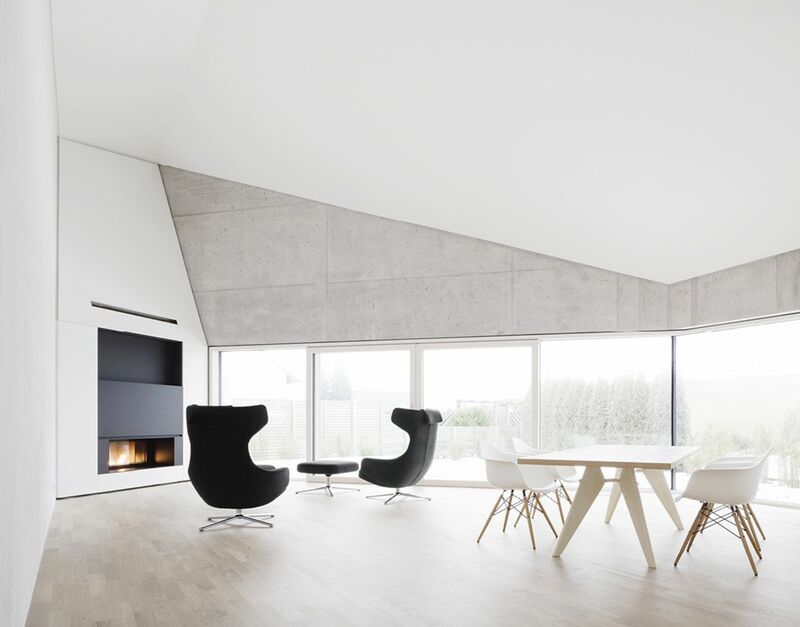 But what we don’t take into consideration in those cases is the versatility, durability and in a way also the beauty of concrete. 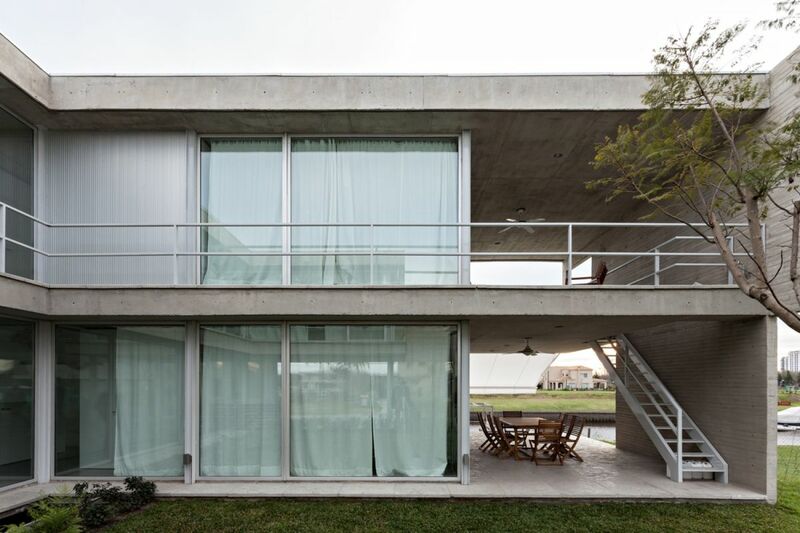 All of these are characteristics which can be exploited in great ways by architects and designers and these dream concrete houses are perfect examples. 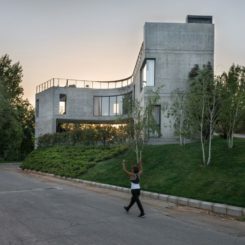 Would a concrete house look out of place in a forest clearing or on a plot where the only neighbors are the trees and grass? 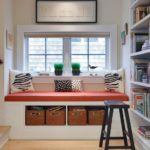 Well, yes and no. 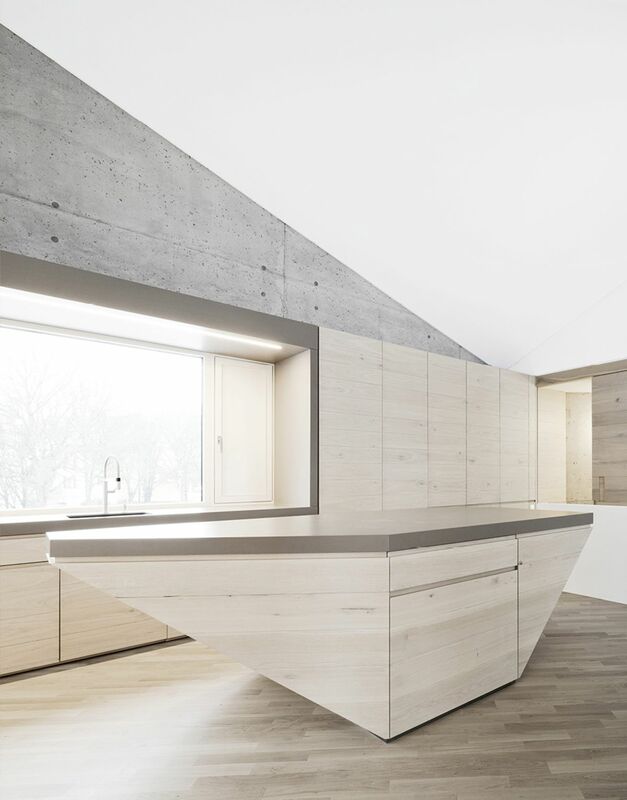 Look at Konieczny’s Ark, a project developed by in Krakow, Poland. 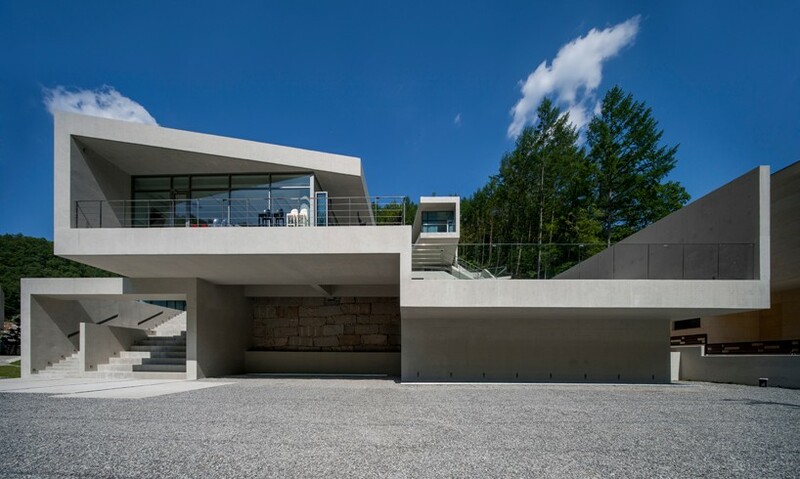 It’s a house that was shaped by the site on which it stands in the sense that given the remoteness of the site, security was an issue so the architects found a clever solution: to design the house in such a way that only one corner touches the ground while the rest of the building hands over the edge of the hill. 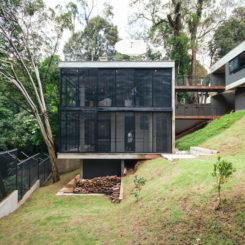 This solution also reduced the risk of landslide as rain water flown naturally under the house. 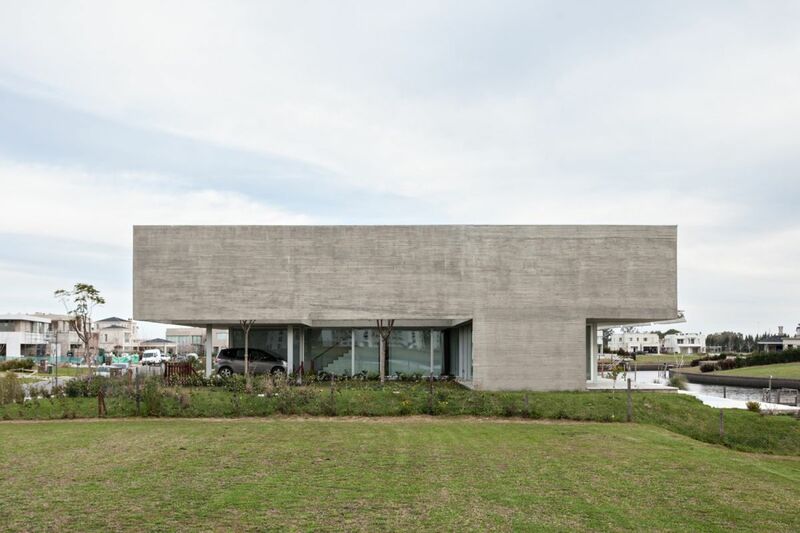 So, you see, even if this concrete box doesn’t really seem to blend in at first, it’s actually very well adapted to its location. 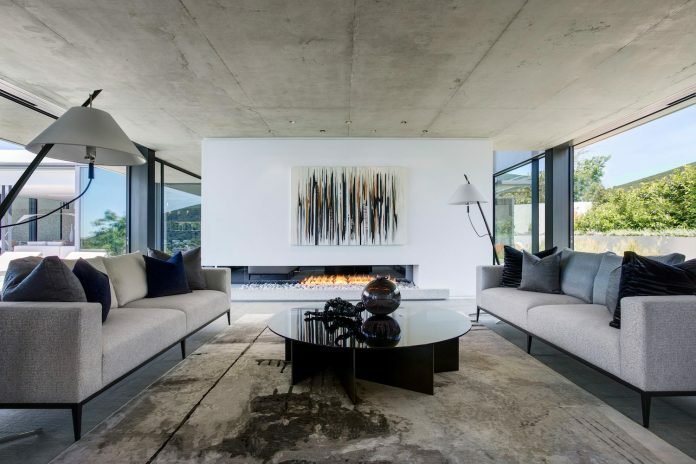 The idea of living in a fortress can sound pretty awesome. 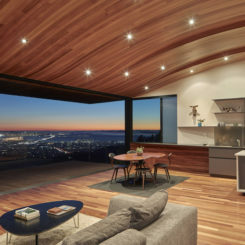 You’d definitely have plenty of privacy and security but how would such a structure have to look like so it could more or less fit in a usual urban or rural setting? 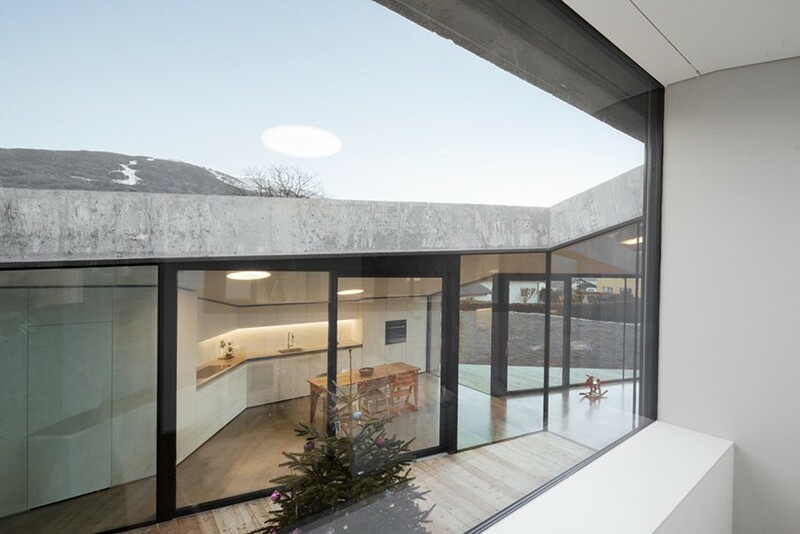 An answer to this question can be the house designed by along the Rhone in Switzerland. 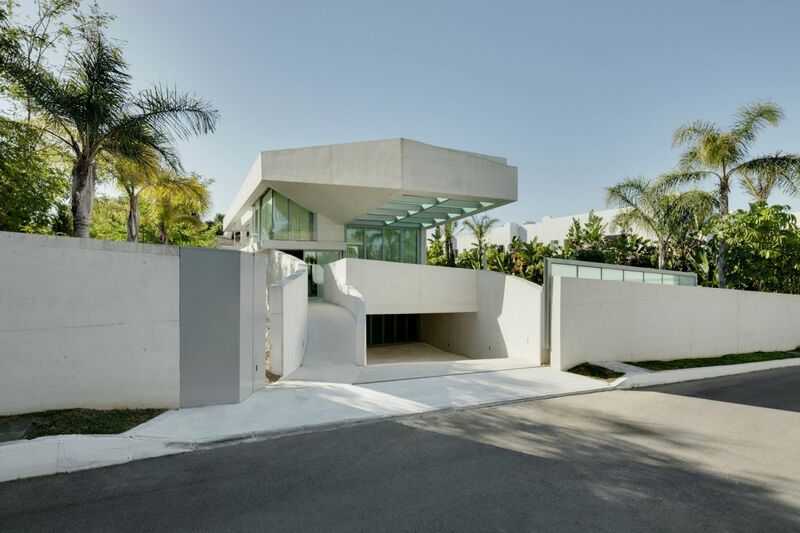 The project uses concrete as a primary material and the house looks a lot like what would be a modern and stylized version of a fortress. 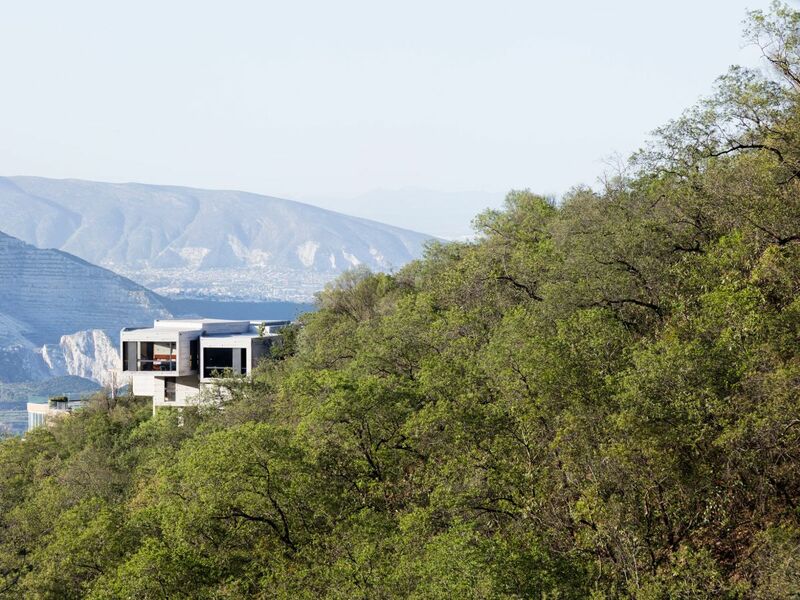 It has an unusual form which mimics the silhouettes of the Alps visible in the distance. 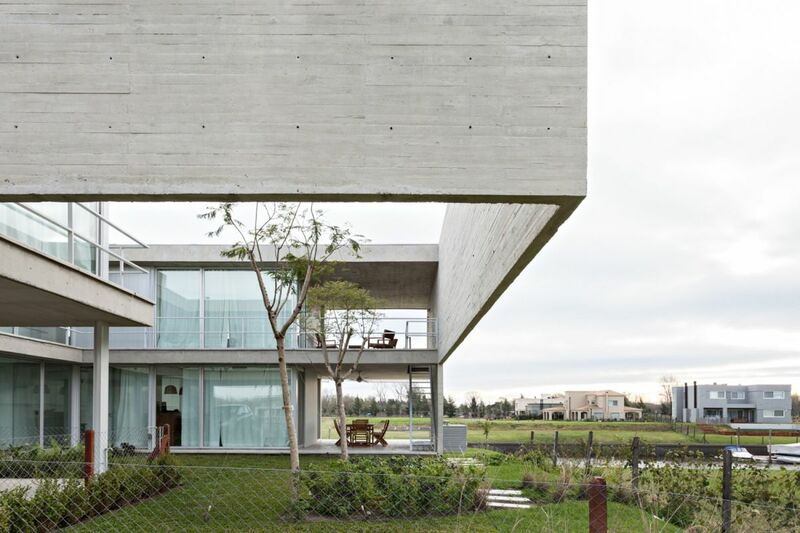 Walls of raw concrete define the facade and set a border between the interior spaces and the surroundings. 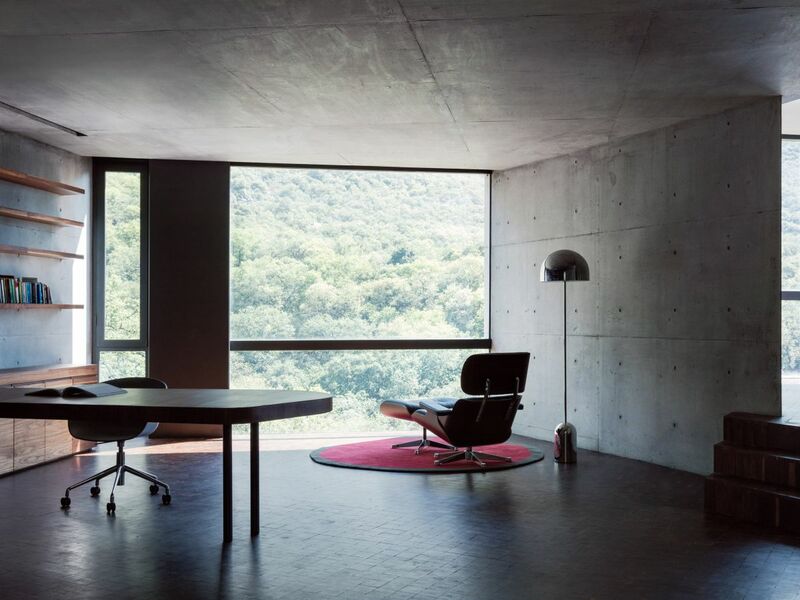 But not all concrete houses look like compact boxes or fortresses. 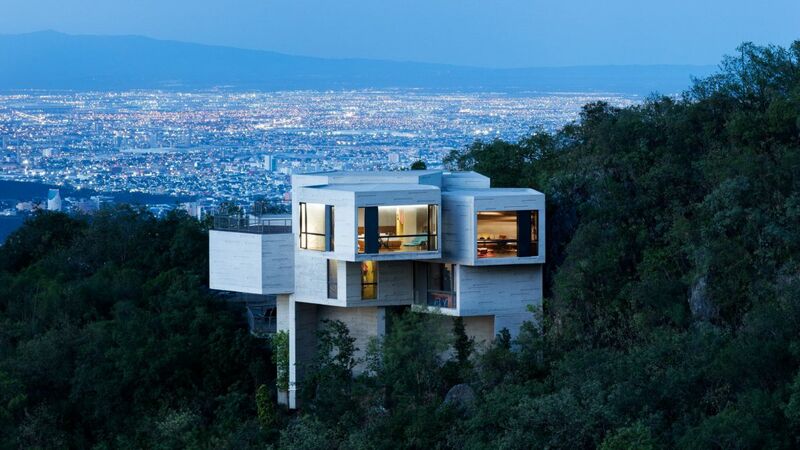 This residence in Mexico City proves that a concrete home can also be open to the surroundings. 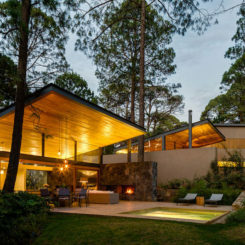 This was a project by JJRR/Arquitectura. 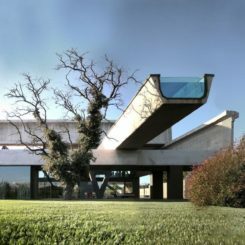 The architects made sure that the house takes full advantage of its location and in particular the views by elevating the building 1.3 meters above the ground. 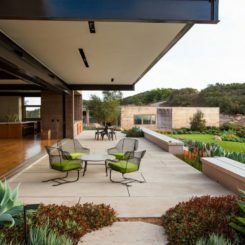 Full-height windows and a green roof terrace allow the house to blend in naturally and to open up the interior spaces to the views and the vast outdoors. 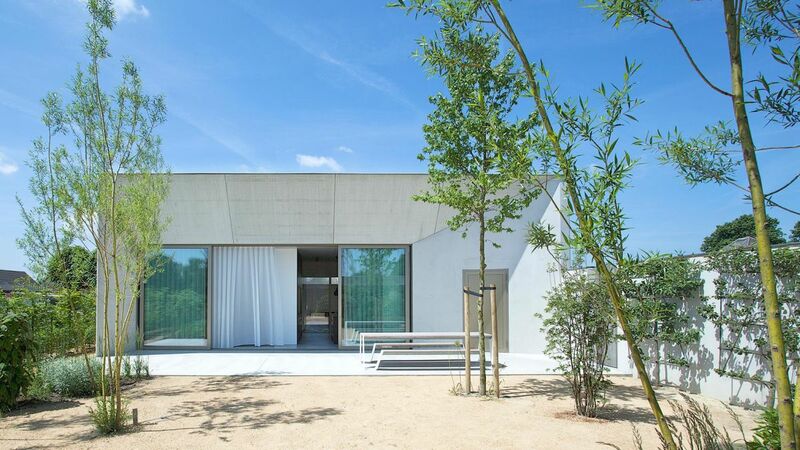 For a house that tries to close itself off as much as possible in respect to the street and the neighbors, this family home has surprisingly open spaces and facades. 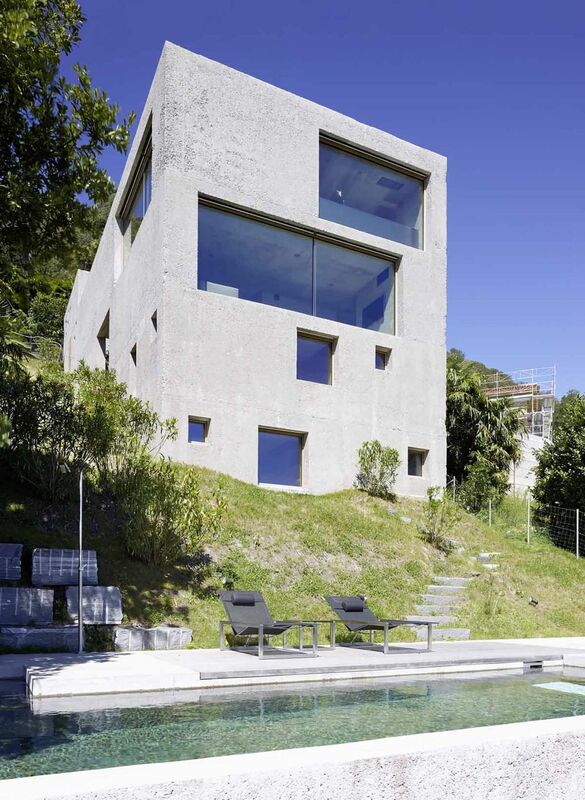 This unusual combination was achieved by architects by combining two contrasting materials: concrete and glass. 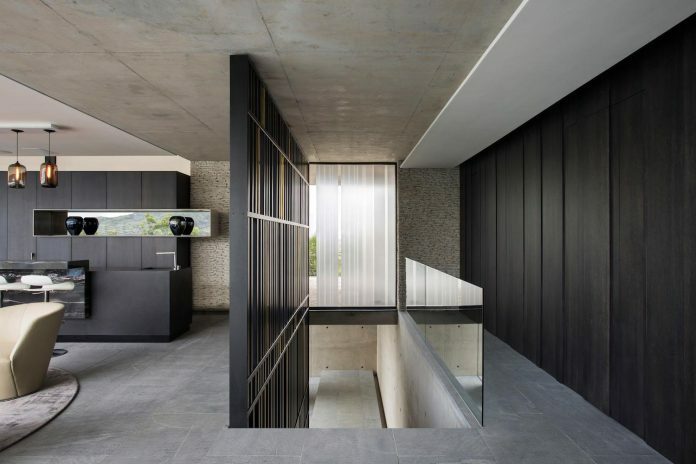 The design strategy was to have a more open ground floor while the first floor is closed and private. 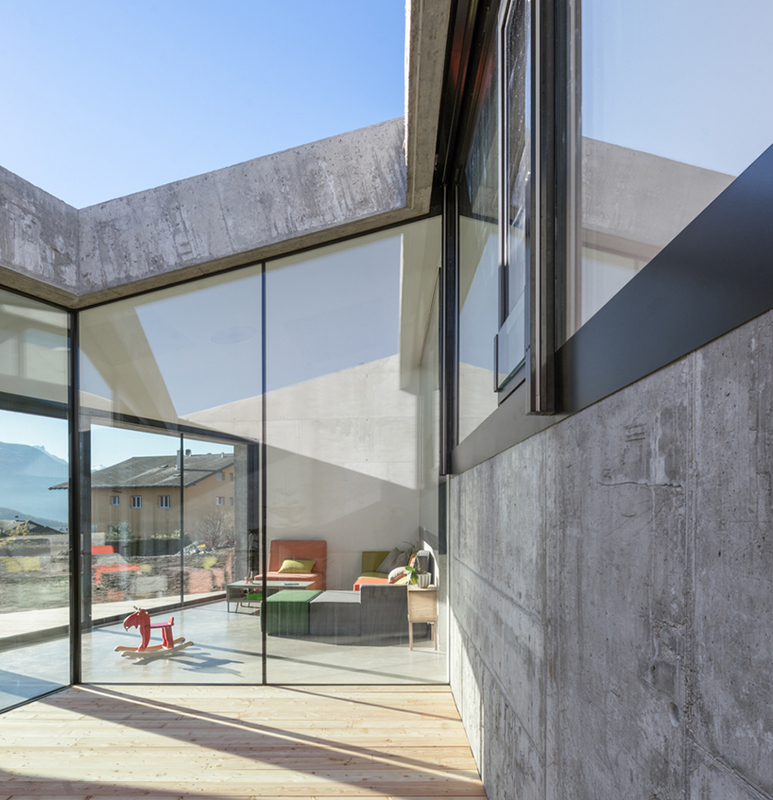 Both floors have full-height glass walls but the difference is that there’s a concrete shell which wraps around the upper floor, framing the spaces and blocking the views but at the same time allowing them to be fully open to the courtyard. 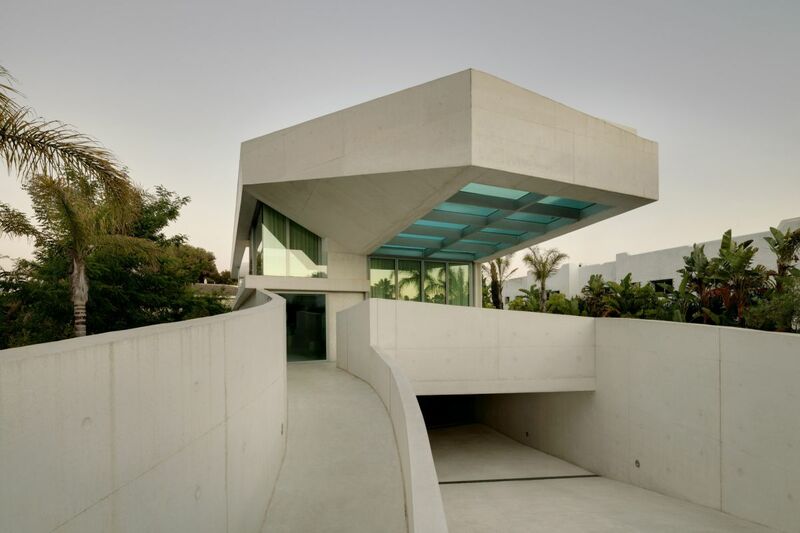 This is the Jellyfish House, a residence built by in Málaga, Spain. 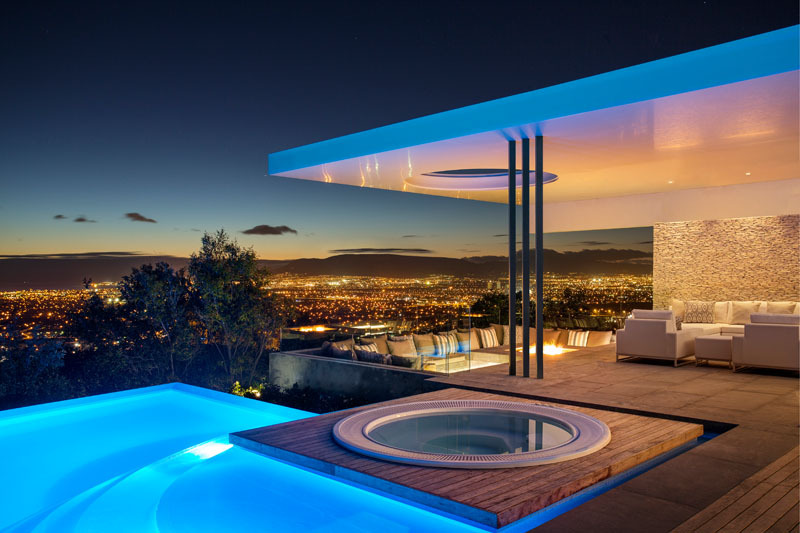 It’s an interesting house for several reasons. 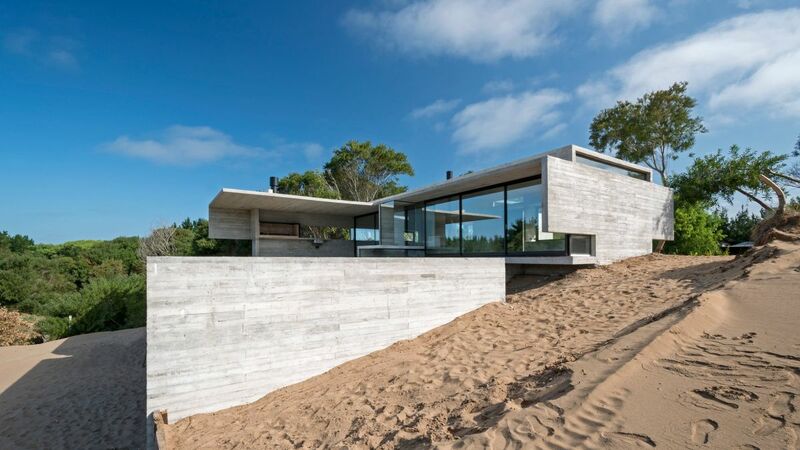 First of all, it’s an inspiration for other projects because of the way in which it deals with its neighbors that are blocking its view to the sea. 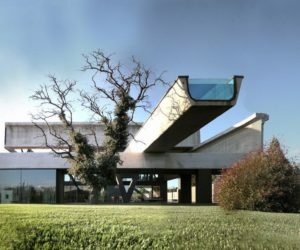 The house was designed on four levels with a rooftop pool that cantilevers 9 meters to the South-West. 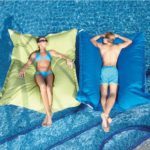 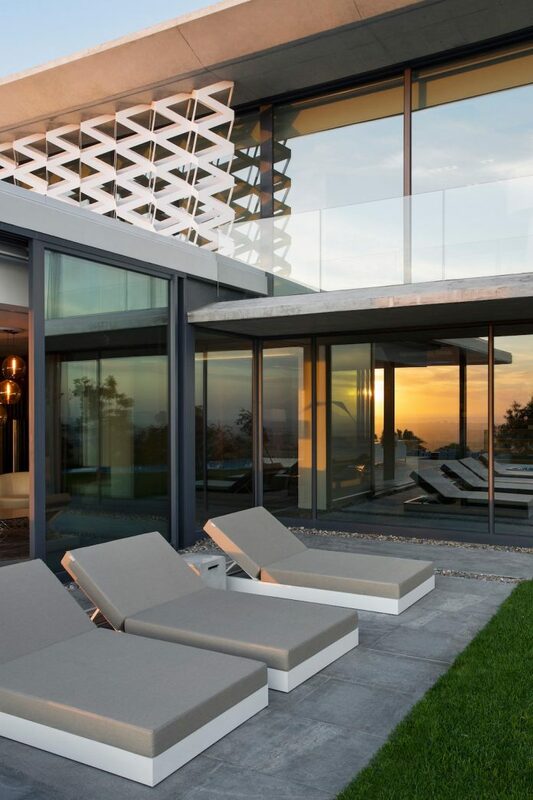 It was designed this way so that views of the sea can be admired while relaxing on the terrace or swimming in the pool which, by the way, has a glass bottom. 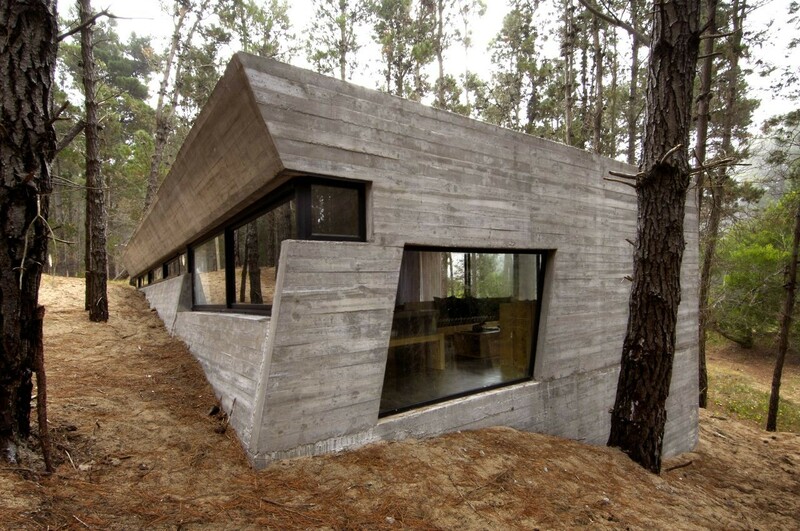 You’d think that a concrete house wouldn’t have much in common with nature but you’d be wrong. 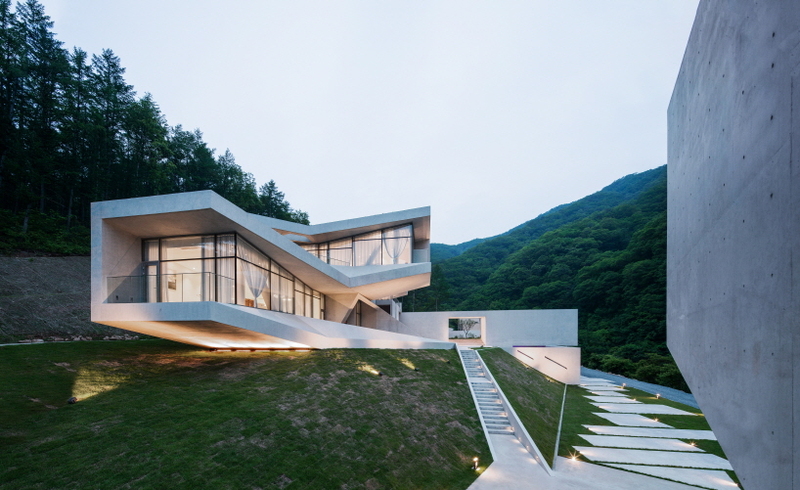 Just look at this gorgeous retreat in South Korea. 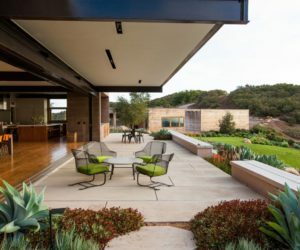 The U Retreat was designed by on a steep site overlooking a sharp vertical cliff and nature and the surroundings had a lot to do with its unique design. 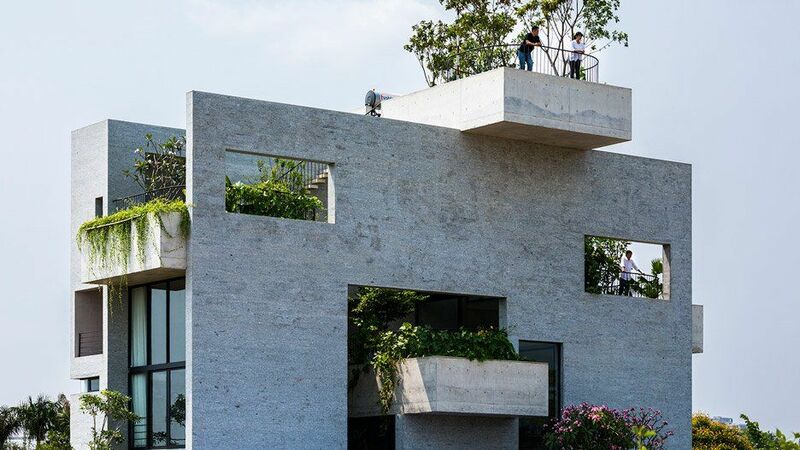 The forms of the cliff and the trees that surround the building were inspiration for the forms and layouts that define the concrete structure. 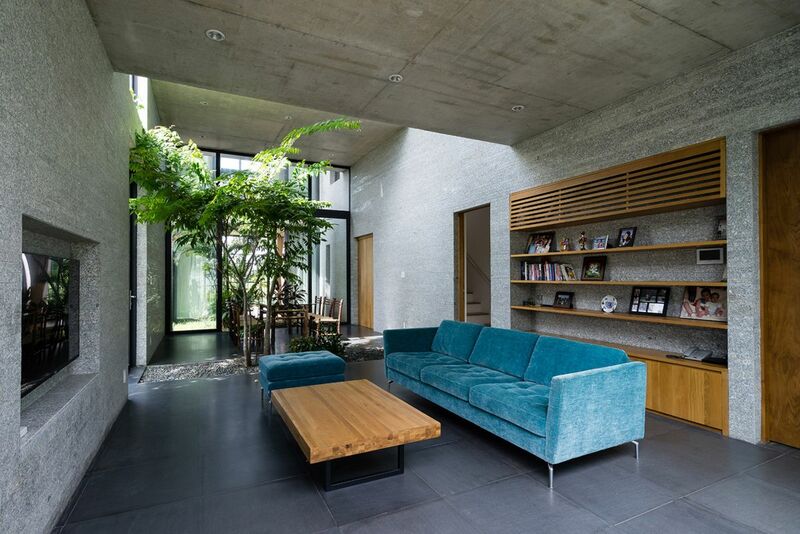 Concrete and greenery are actually a pretty great combo and what better way to show you this than with a project called House for Trees? 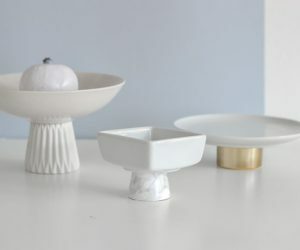 It’s a series by developed in Ho Chi Minh City. 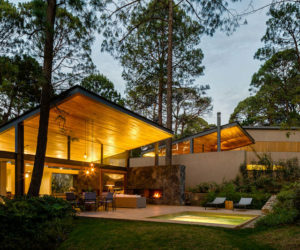 The main idea behind the project was to reconnect the city and nature and to bring more greenery into the residential area. 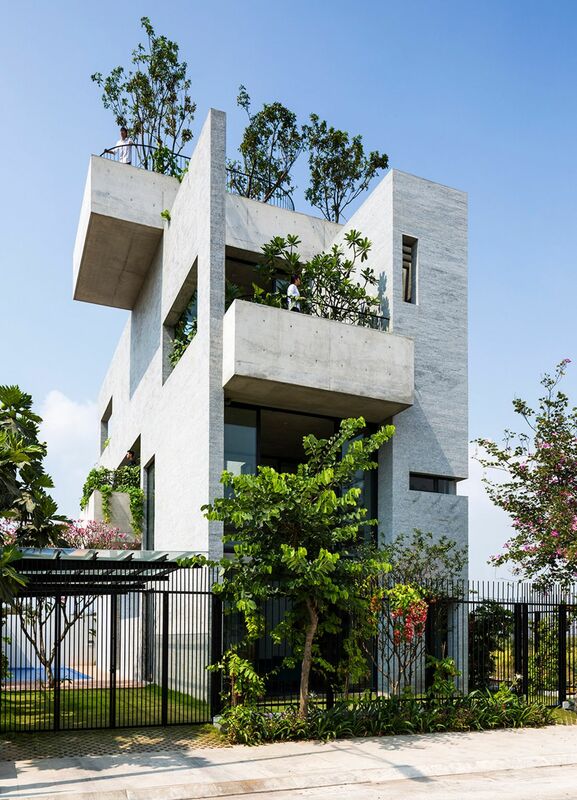 This is the Binh House, one of the structures in the series. 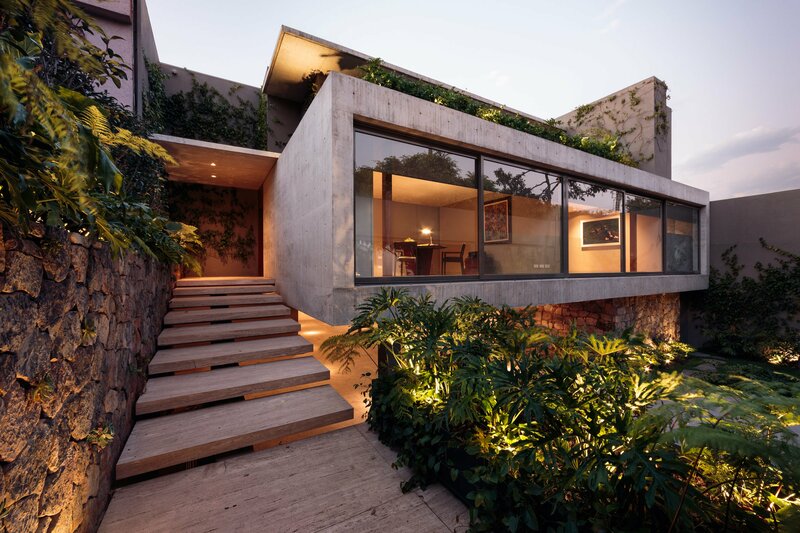 It has several terraces that act as small gardens and you can also see that vegetation has also made its way inside the house. 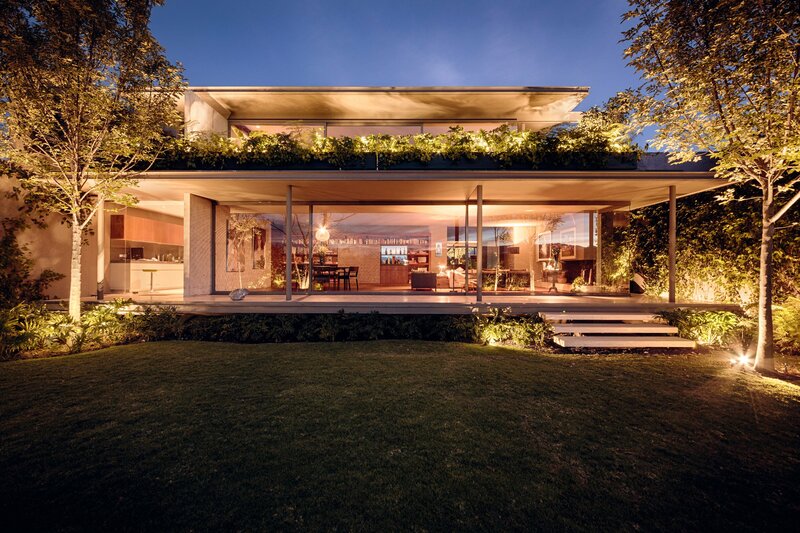 Making a house look natural in its setting, as if it organically grew on the plot is no easy task yet architect did a great job when designing this family home in Mexico City. 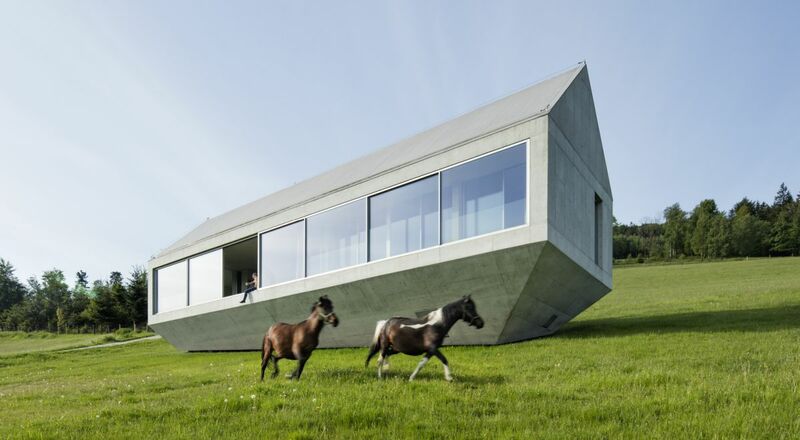 The project is actually a collection of five-sided concrete blocks that seem to naturally emerge from the hillside. 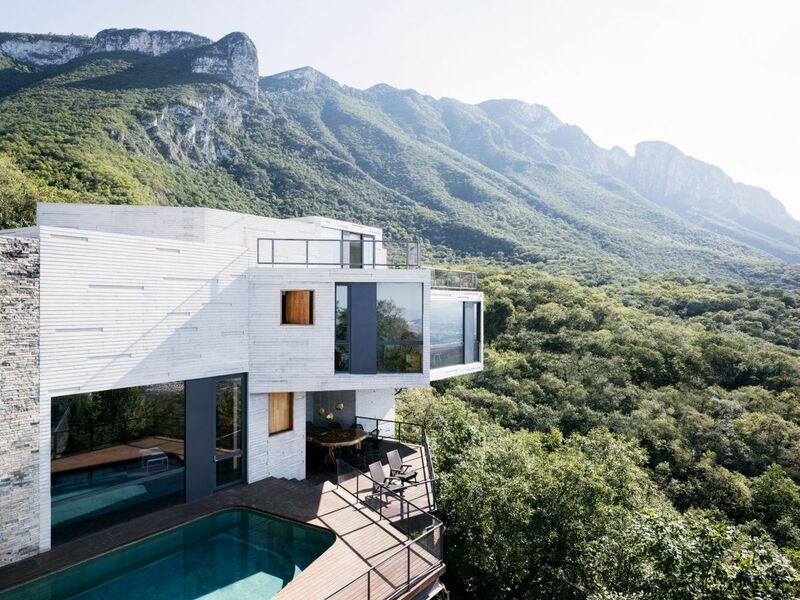 They offer panoramic views towards Monterrey as each block is strategically oriented to capture and frame different parts of the landscape. 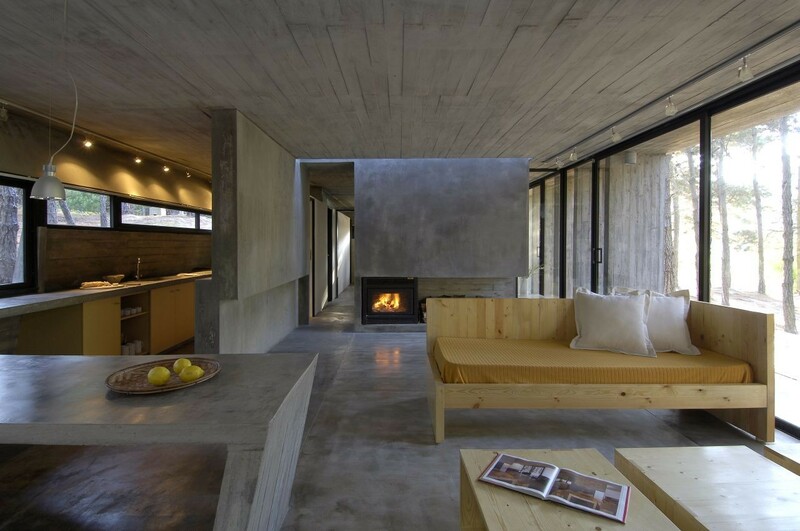 When dealing with a lot of concrete, it’s often nice to balance out its coldness with some warm wood elements. 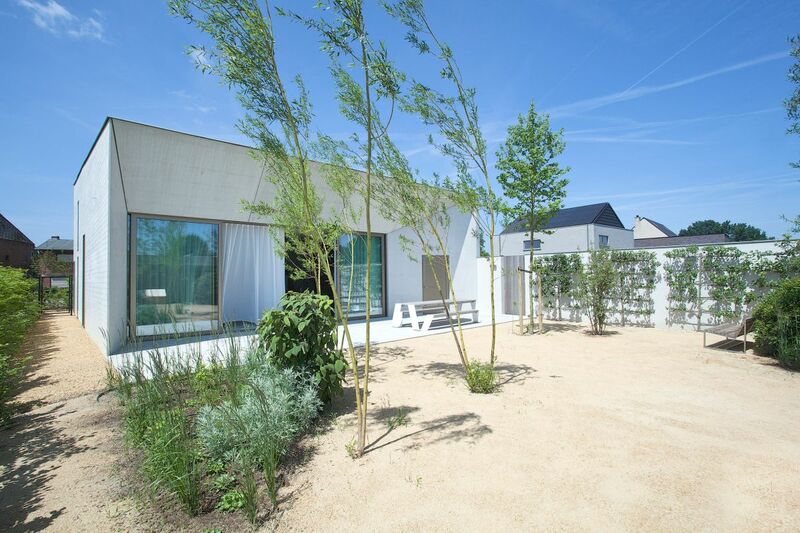 It’s what studio did when designing this residence in Belgium. 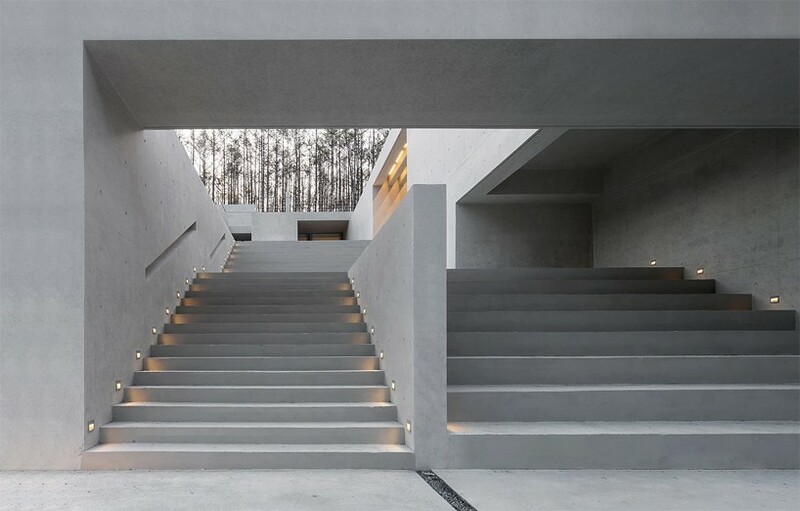 The building is organized around a courtyard and its design is a tribute to Belgian architect Juliann Lampens who is known for the extensive use of concrete both inside and out the buildings designed back in the 1960s. 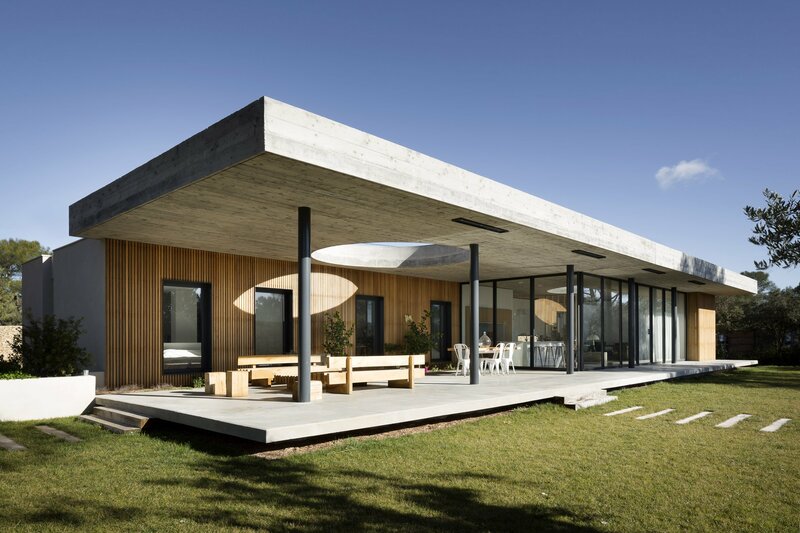 The impact of the concrete in this particular case is softened by the timber and the views of the large garden. 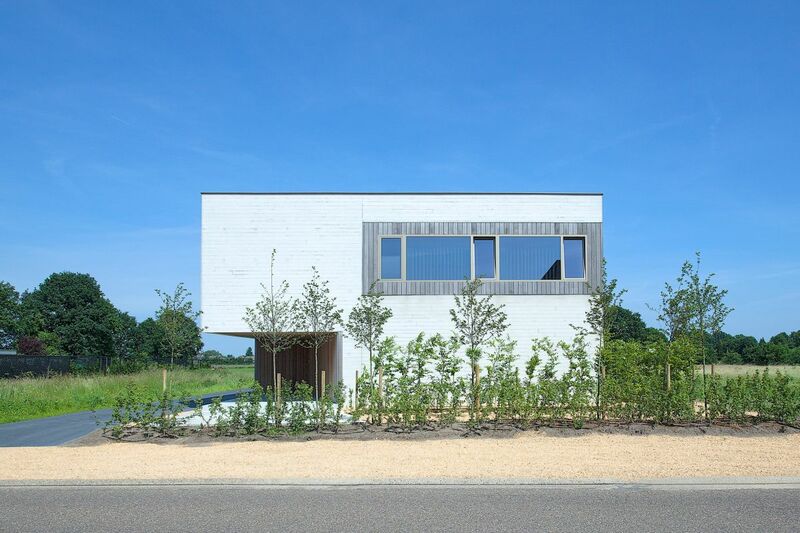 Sometimes we want our homes to blend in and to coordinate with its neighbors but other times it’s nice to stand out. 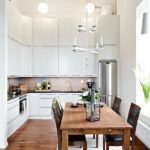 This three-story family home in Pliezhausen, close to Stuttgart, is one of those cases. 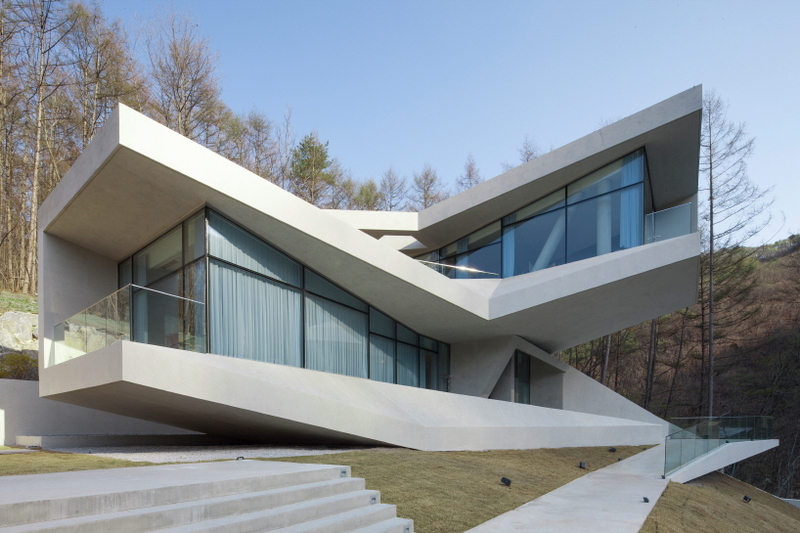 The house was designed by who gave it an unusual crystal-like shape. 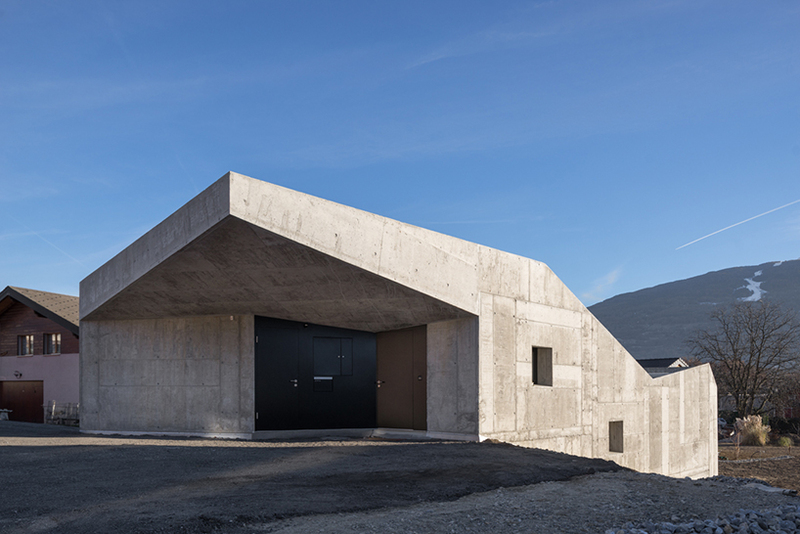 The unusually angled concrete facades offer an unexpected advantage: wonderful views of the surroundings. 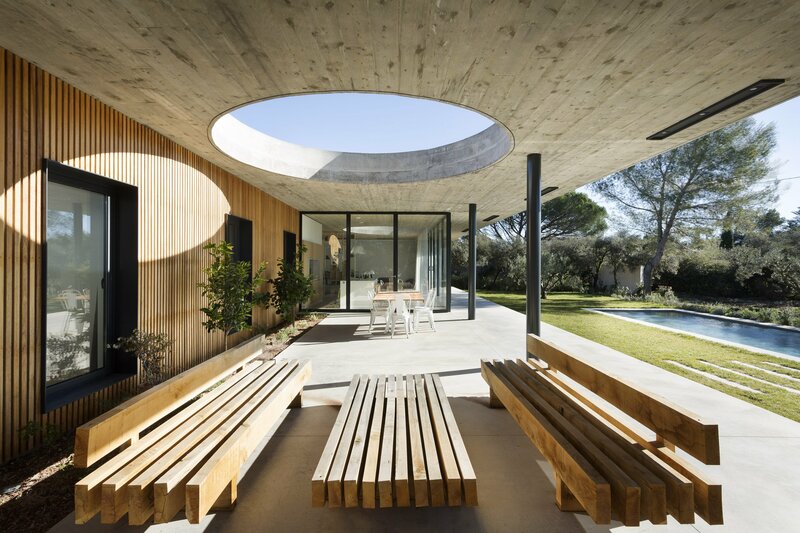 It’s a design that opens the house to the outdoors in an unusual but great way. 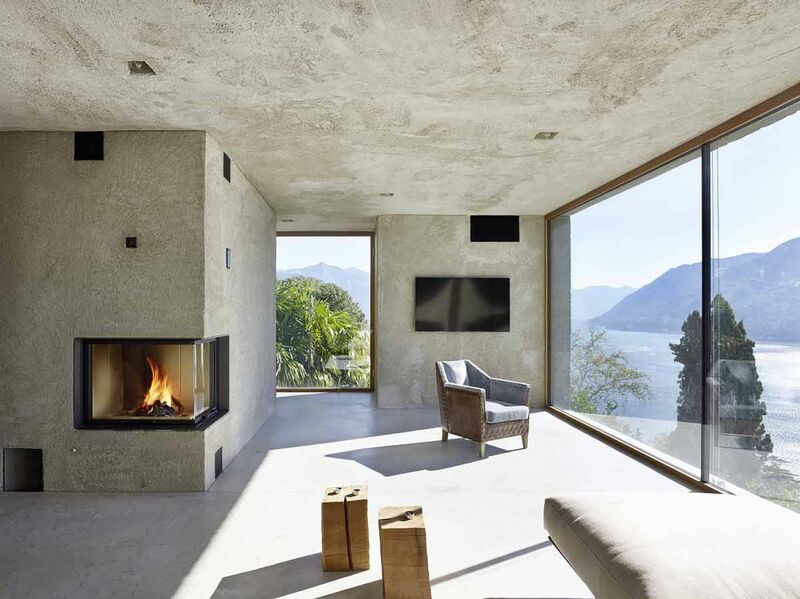 This house from Brissago, Switzerland looks incredibly simple, like a concrete monolith with cut out windows from place to place. 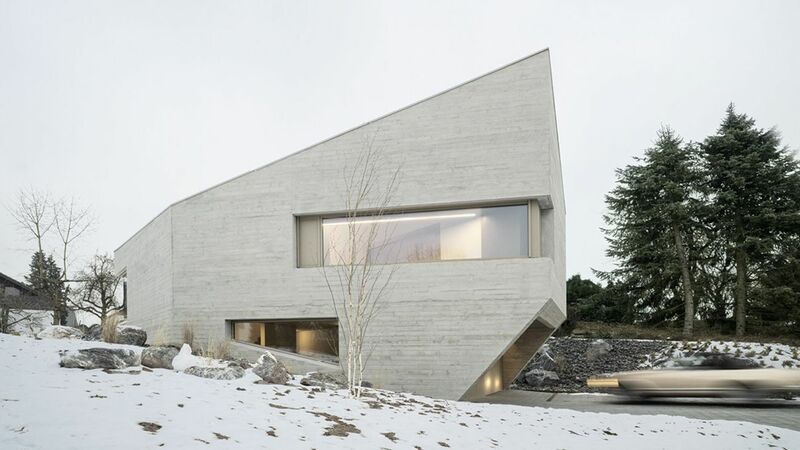 It looks as if it’s been on that slope all along and only recently carved into a home. 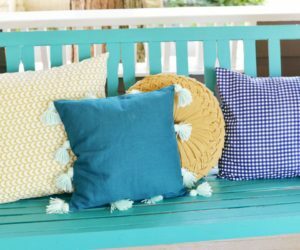 It’s a great look managed by . 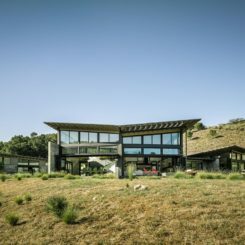 Because it sits on a steep slope, the houses has the entrance on the top floor and the parking lot up on the roof level. 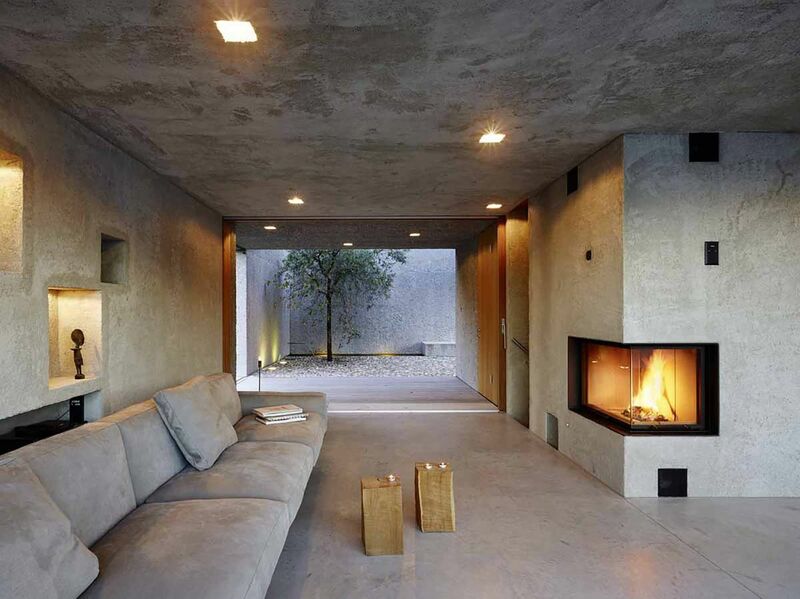 Its raw concrete facades are minimalist and intriguing and the interior matches this look. 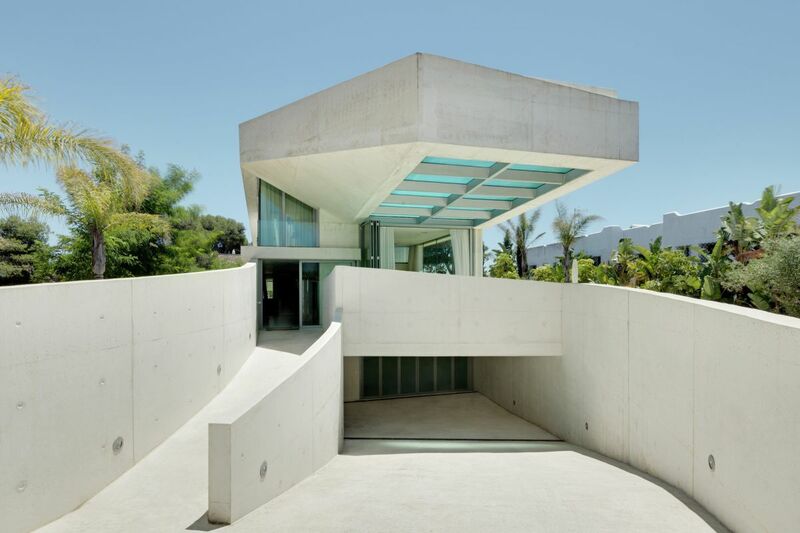 The geometry of the City Villa is a very interesting one, being the defining feature of the design created specifically for this project. 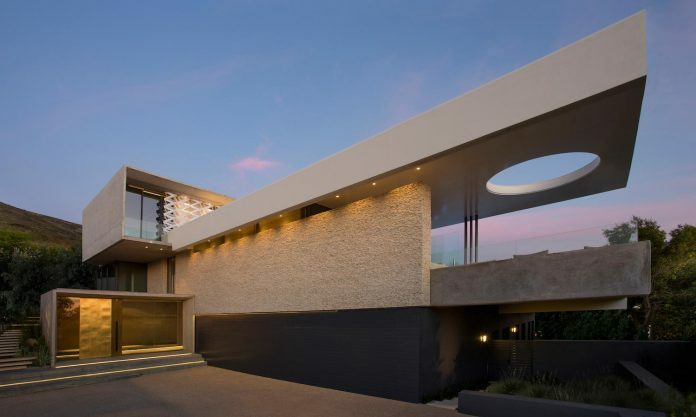 This is a modern family home located in South Africa. 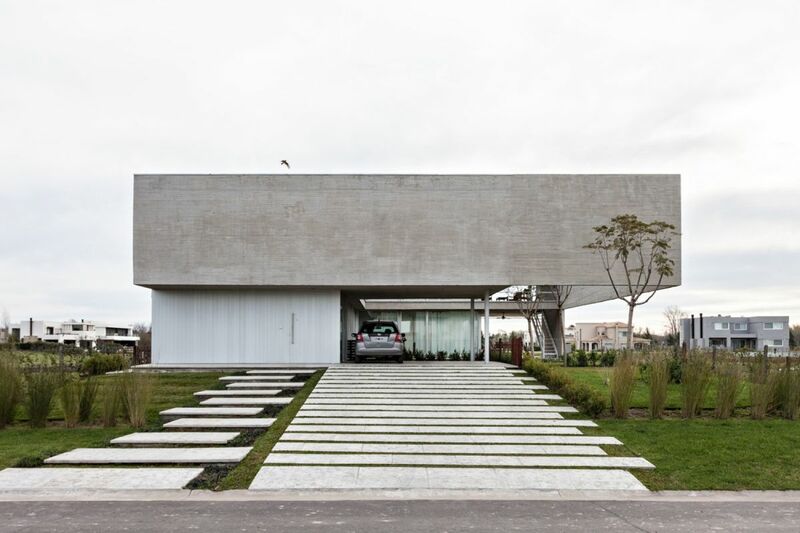 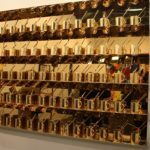 Its design is a collection of rectangular volumes placed on top of each other. 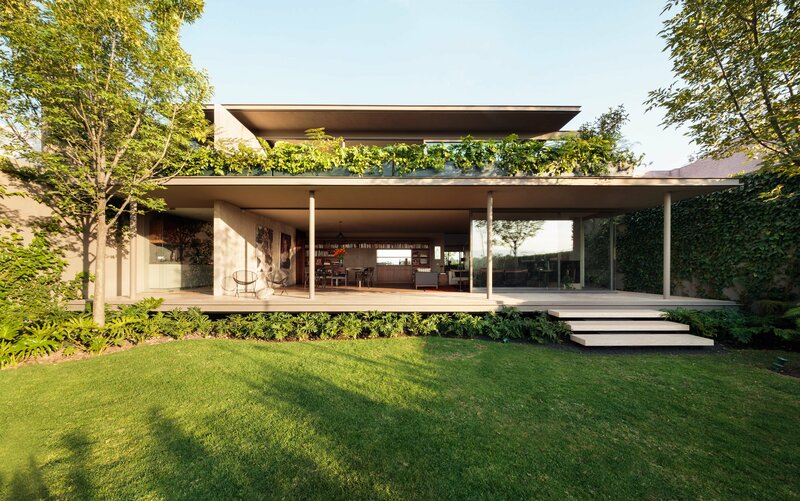 Some of these volumes cantilever to the sides, forming terraces. 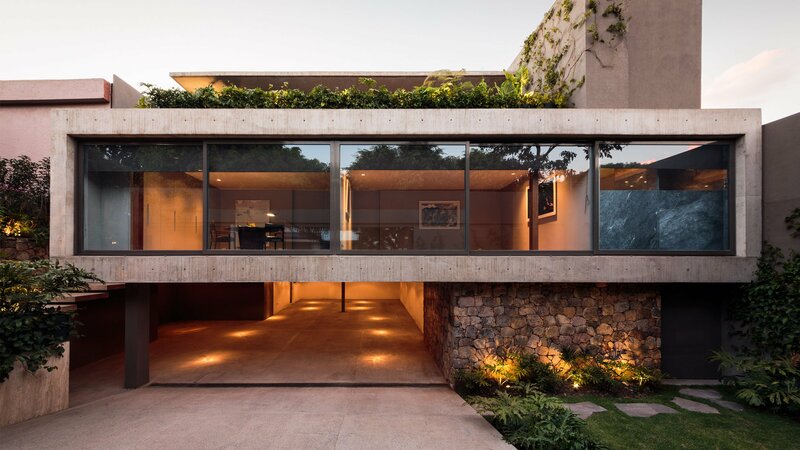 A stone wall contrasts with the concrete, adding texture and diversity to the design. 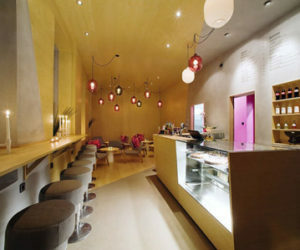 Other contrasting elements include the brass front door which was custom designed and all the glass surfaces. 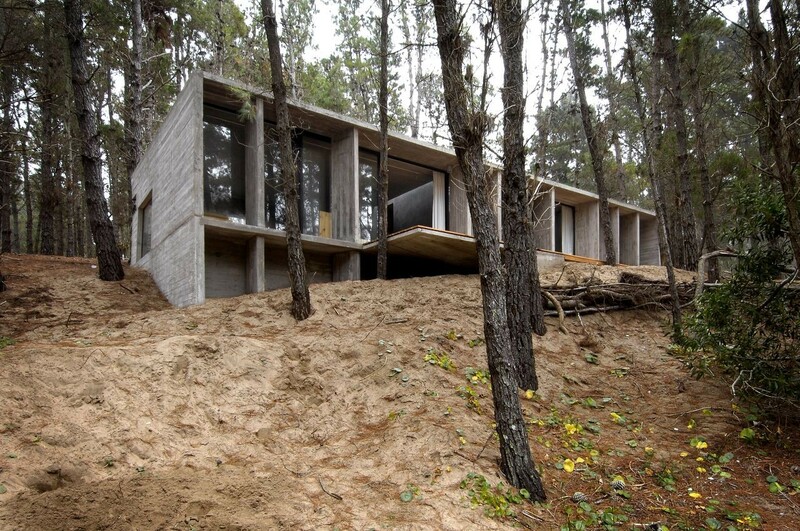 This forest house is located in Mar Azul, Argentina. 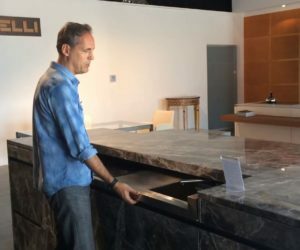 It was built by on a site full of challenges. 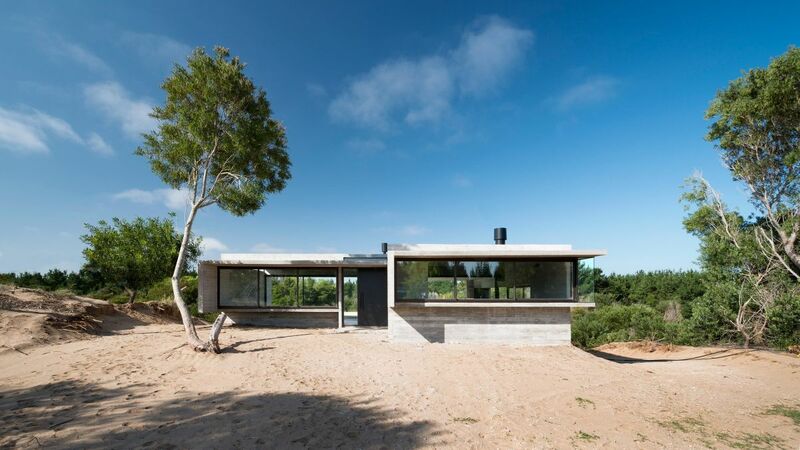 The owners wanted it to be away from the sea and the populated areas so it can serve as a private, intimate and remote refuge. 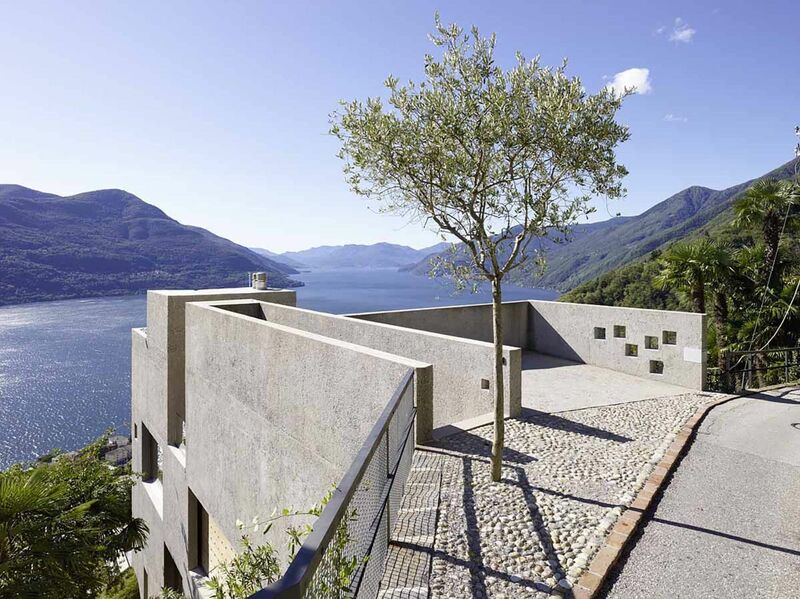 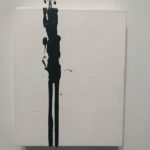 At the same time, they wanted to be in with nature and the landscape. 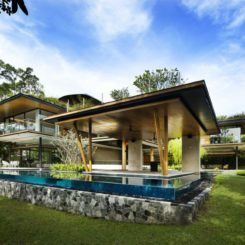 To these requests the architects responded with a single level design for a structure that has a concrete shell and vast openings. 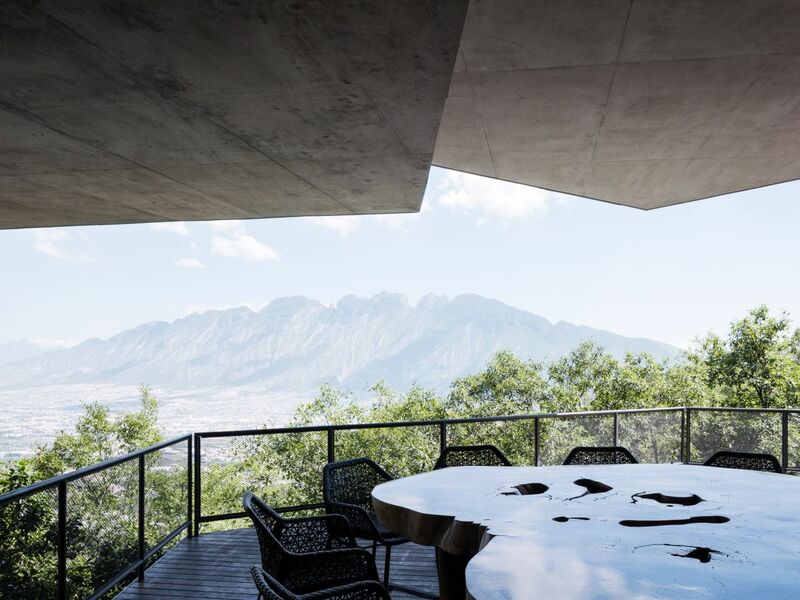 It sits on a flat section of the site and it offers uninterrupted views of the surrounding landscape. 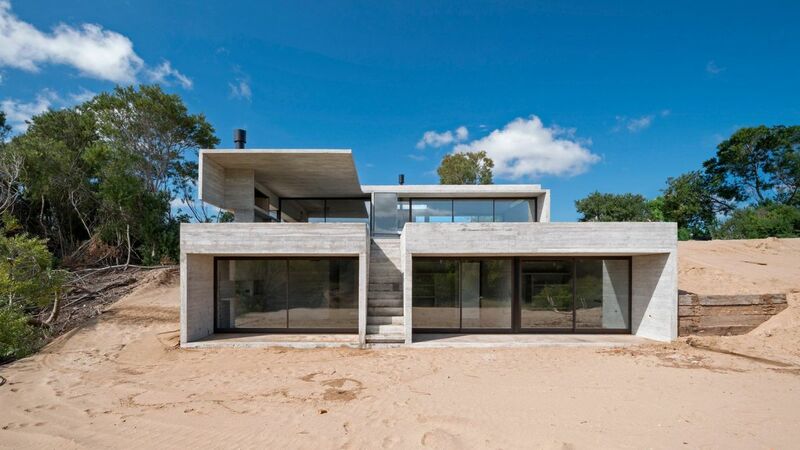 This is a dune house located near Buenos Aires. 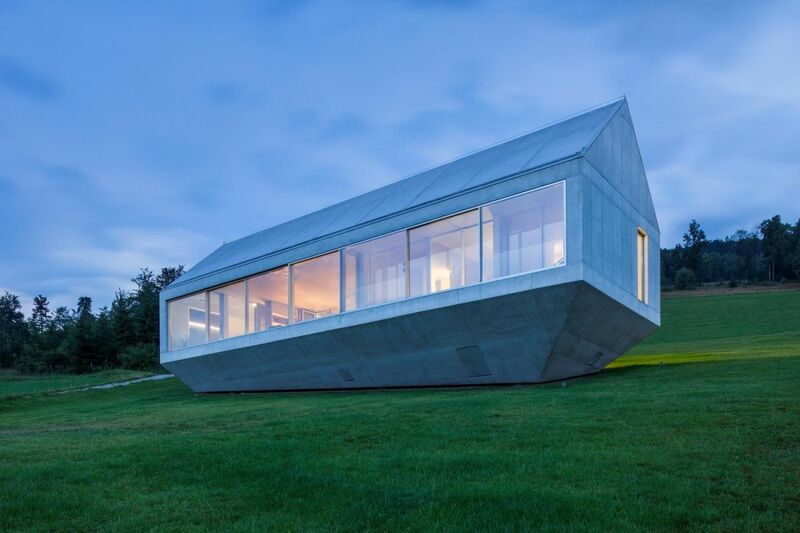 It was built by and it’s a concrete structure designed to be enjoyed during summer. 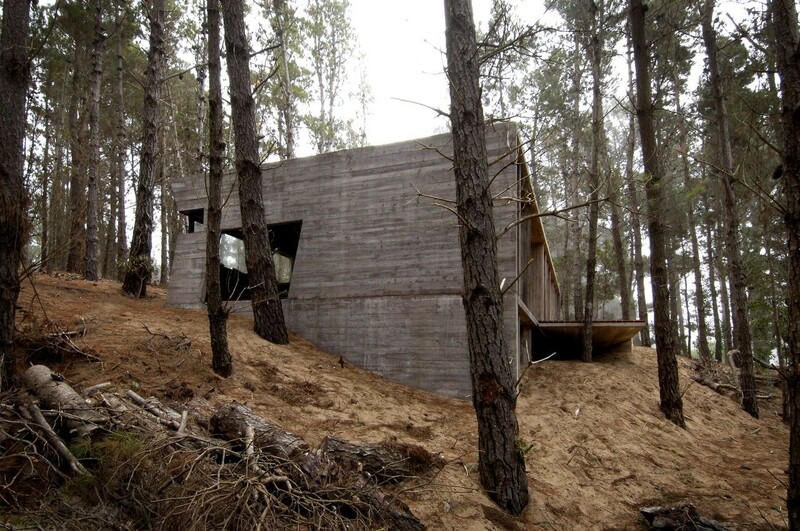 The site on which it stand has an uneven surface, sloping towards a pine forest. 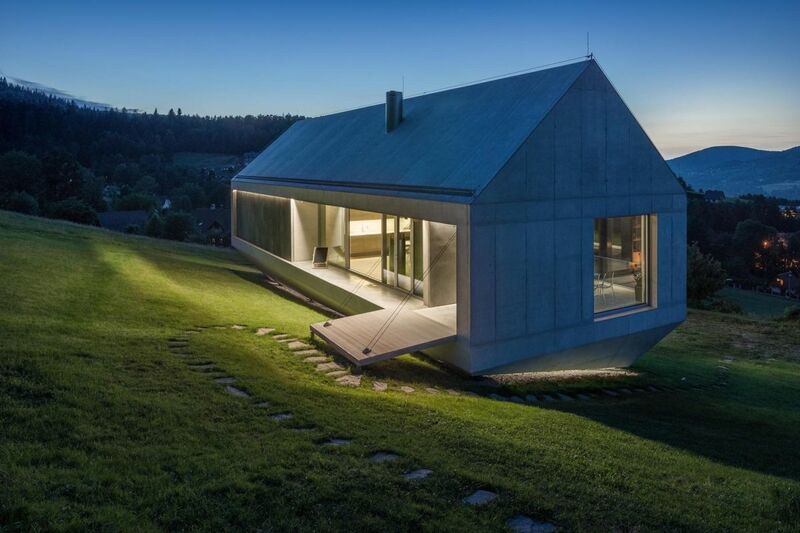 The house follows the natural topography of the land and becomes partially embedded into the slope. 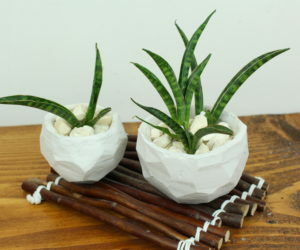 This helps it better communicate and blend in with its surroundings and the sand dune which it traverses. 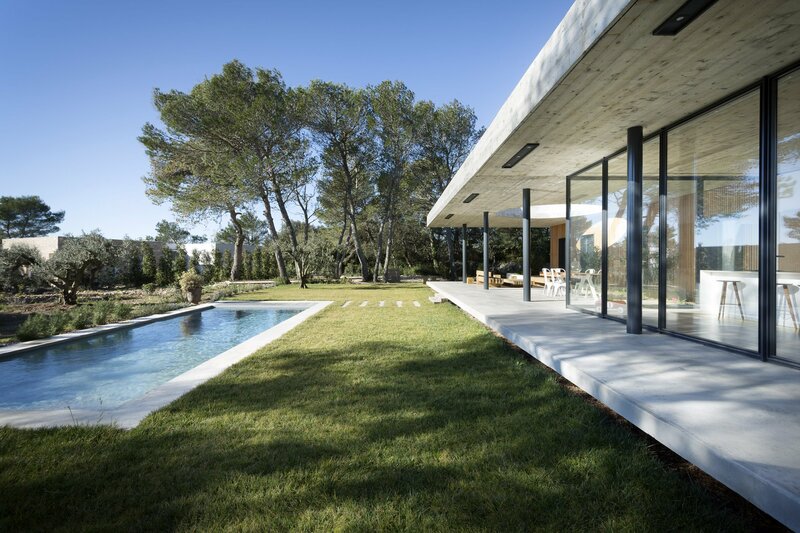 We conclude our list with a gorgeous concrete and wood house located in Southern France. 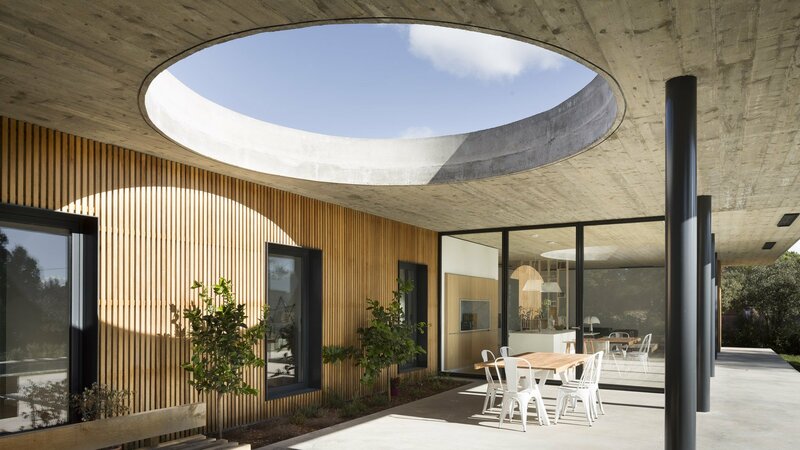 It’s a project by who designed it with large glass doors that open up the living spaces to the garden and also with a large circular skylight carved out into the terrace roof. 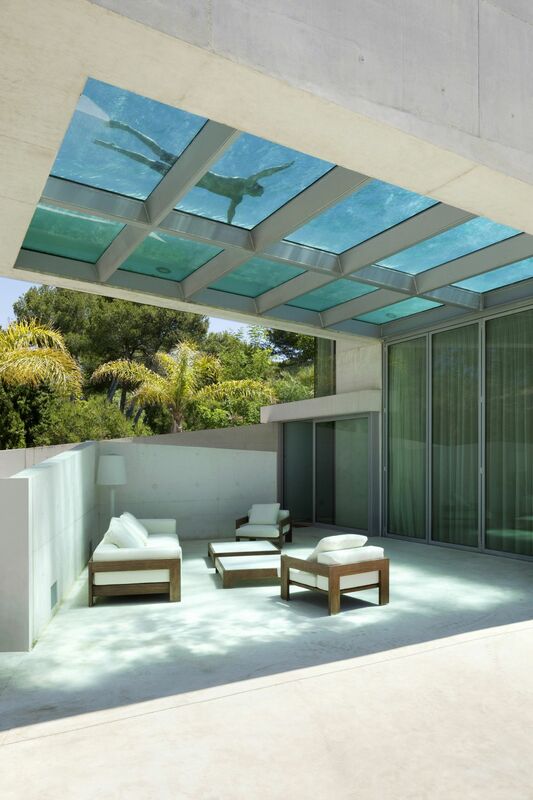 The skylight is an unexpected and unusual detail. 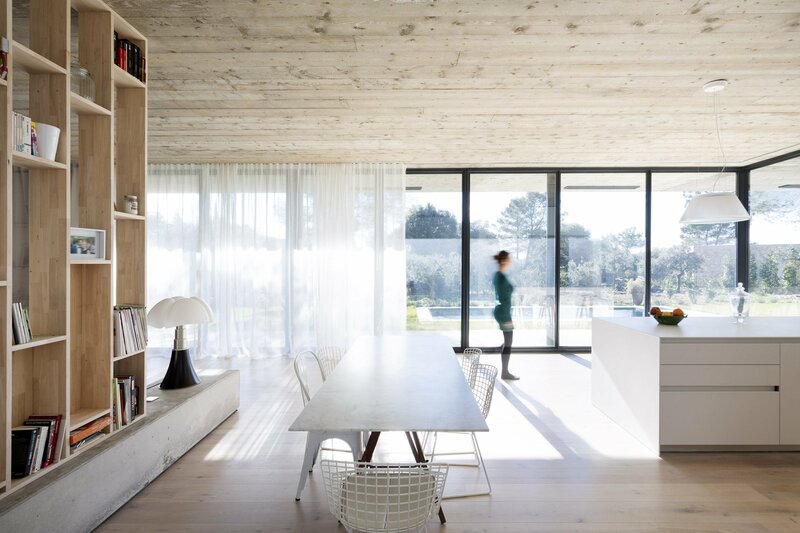 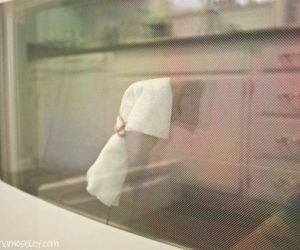 It opens the outdoor spaces to views of the sky and it also brings more light into the kitchen, which is welcomed especially in winter. 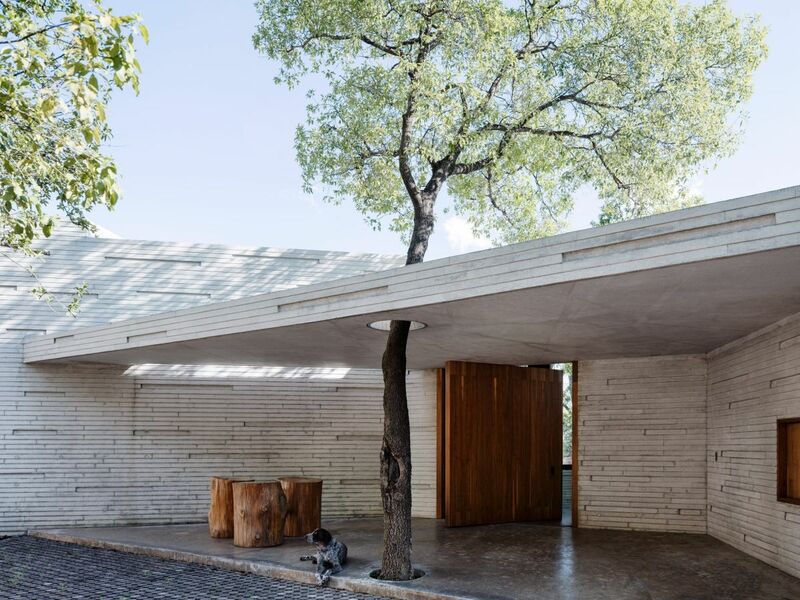 What’s especially beautiful about this house is the dialogue between the concrete and the wood, two materials that complement each other in a really great way.